"Kill them all. The gods will know their own." The Inquisitor fulfills a militant support role by providing restorative and protective benefits to her allies. 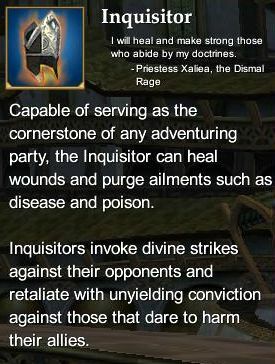 The Inquisitor is able to mend wounds and purge ailments of all sorts, while striking opponents with divine power. Inquisitor Epic Weapon Series (80) - Rise of Kunark Inquisitor Epic Weapon. This page last modified 2011-08-25 22:53:33.